Baked Ziti or Zitoni pasta with spicy sausage. Baked ziti pasta with spicy sausage. 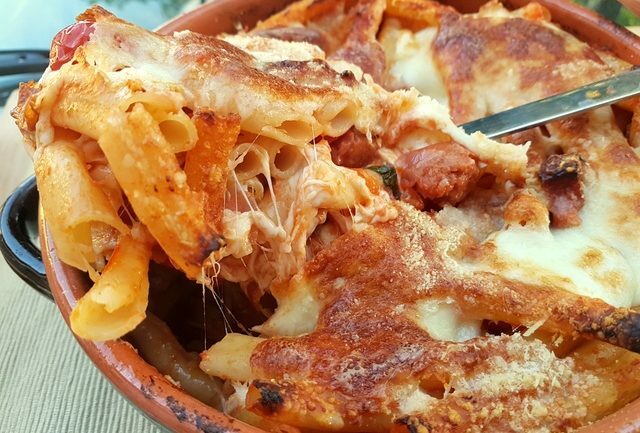 Baked ziti pasta with spicy sausage, sometimes also called ‘alla diavola’ (devilled), is a great Neapolitan dish for those who love spicy food. 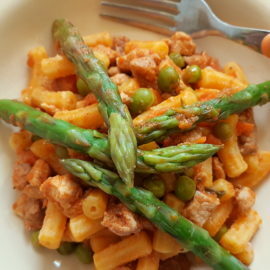 Pasta prepared in this way is really tasty and attractive and this recipe is simple and fast to make. 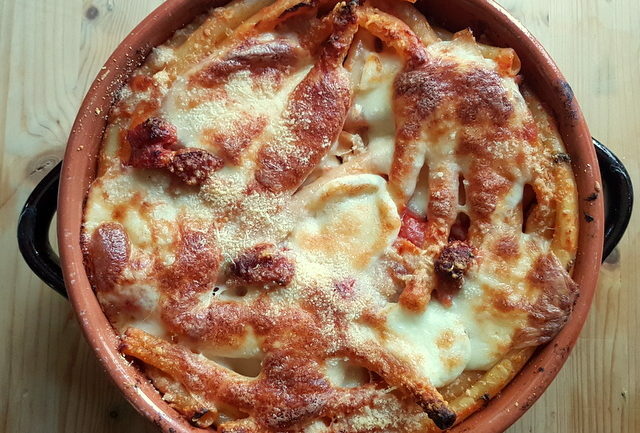 Ziti alla diavola al forno. Ziti and its slightly wider cousin zitoni are long pasta originally from Campania, usually made from durum wheat. They look like narrow tubes, but are both about 25 cm long. This pasta is traditionally broken into smaller pieces by hand before cooking. But, for this recipe you can keep the pieces long or break them. Already cut ziti and zitoni are also available to buy. 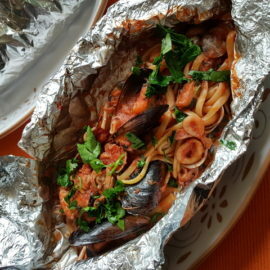 There are a number of delicious Italian recipes for baked Ziti or Zitoni from Campania, as well as Puglia, Calabria and Sicily where this pasta is also popular. 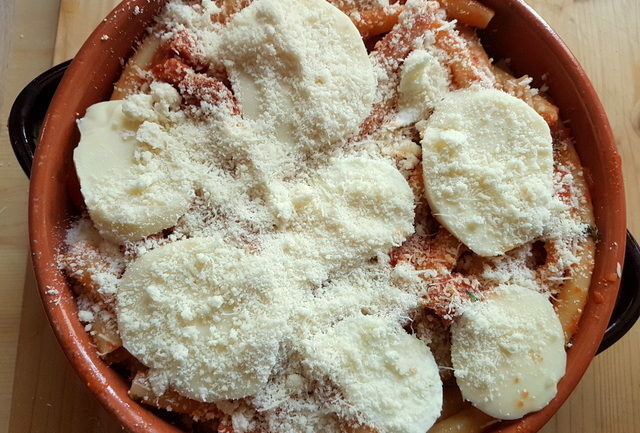 In addition, Ziti can be used in other baked pasta recipes such as those for candele (an even longer pasta) or penne or rigatoni (pasta tubes) . In the same way, if you can’t find long tubes, you can use short ones instead. In this recipe for baked ziti pasta with spicy sausage, the pasta is dressed with spicy Calabrian sausage cooked in tomato sauce and basil. 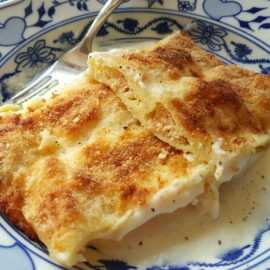 The ingredients are layered in an oven dish and enriched with slices of scamorza and mozzarella. The result is really flavourful! Both my hubby and my son had second helpings, so make sure you make enough. Leftovers are tasty too, so don’t worry if you make too much. Stick it in the fridge and eat it the next day! Which kind of spicy sausage? 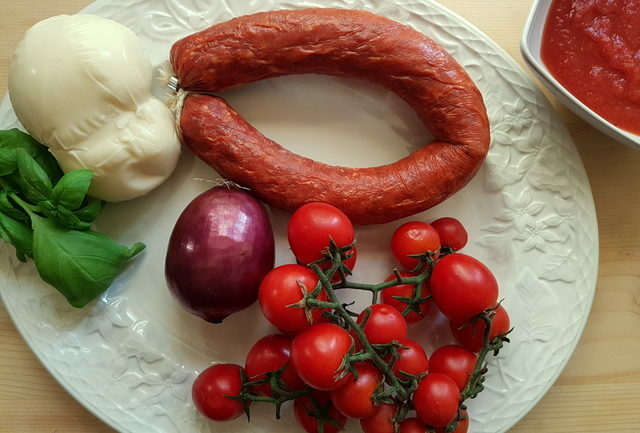 It’s better to use spicy Calabrian sausage or salami if you can find it to obtain the right kind of spicy! I used a semi-soft salami but the sausage can also be fresh. 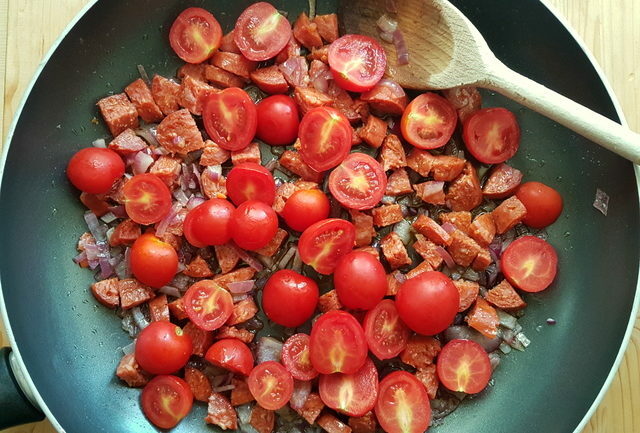 I think chorizo would work well too, if Calabrian sausage is hard to find. 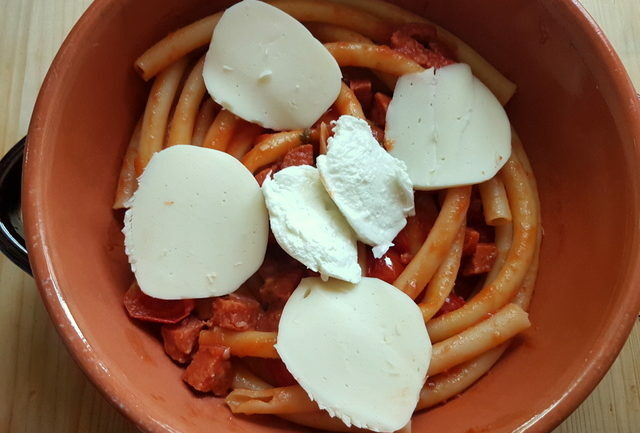 Some versions of this recipe are made with only mozzarella or only scamorza. This time I used both. It made the dish really cheesy! But, I have also made it before with smoked scamorza, which was delicious too. You can choose to use any of these cheeses or two kinds together. This baked ziti pasta with spicy sausage recipe is pretty easy to make. 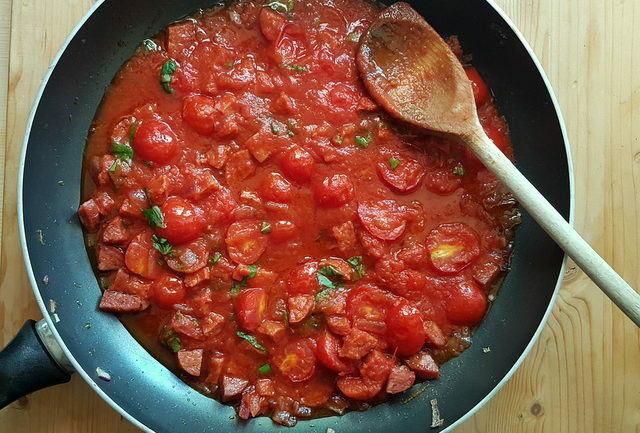 All you need is a tomato sauce, some cheese (scamorza and/or mozzarella) spicy sausage, basil and the pasta, plus some wine, an onion and grated pecorino. Layer everything in an oven dish ( I used a terracotta one) bake for 20 minutes and serve. It’s perfect for Sunday lunches or other days when you need to feed a bigger number. The only important thing to keep in mind is that every one has to like spicy food! 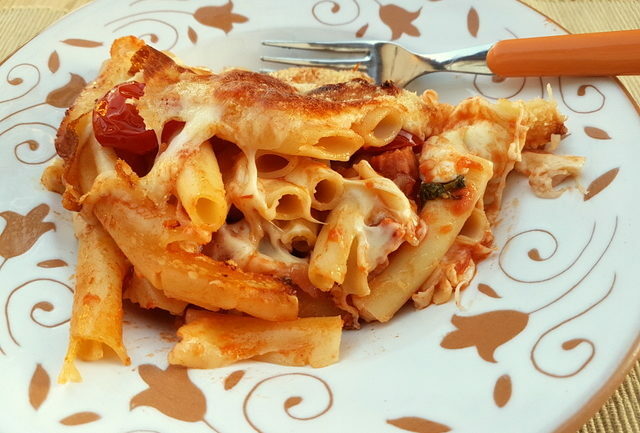 If you are like me and love baked pasta dishes, this is going to be one you’ll love. If you give it a try do let me know how it turns out, either by commenting below the recipe on page 2 or on the Pasta Project Facebook page. And if you feel it’s worth sharing with friends please do. All your feedback and support is much appreciated! This recipe was originally published on 5th August 2017 but has been updated. Other ziti recipes you may want to try! sounds like a great recipe. I love comfort food!! Thanks Camila! Pasta really is the ultimate comfort food and this baked pasta is delicious! Yum! This is the perfect comfort food recipe to start the season! I love that the sausage is spicy – so warming! Grazie Lauren! Yes the spicy sausage really makes this baked pasta so warming! Literally! Thanks Claudia! Spicy sausage really goes well in baked pasta! It’s a family favourite here! This looks so cheesy and delicious! Thank you Amy! Yes very cheesy! That’s how I like it too! This looks so incredible! I love the fact that you used both cheeses – I’d do that too, I love really cheesy things! Thanks Bintu! The more cheese the better, that’s what I say! I love ziti! I think I’ve only ever seen it when it’s already cut into the short pieces… never long ones. 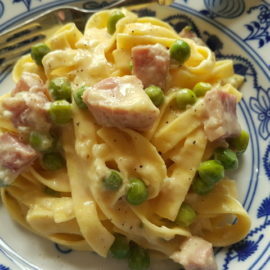 You have access to some FABULOUS pastas! I love a spicy sauce too, so I know my family will like this one. Do you ever use whole grain pasta? Hi Catherine, I know there are so many different types of pasta here in Italy. We’re really spoiled for choice! Yes I use whole grain pasta too. It’s become very popular with Italians and many companies now produce organic pasta from heritage grains and even other types of flour instead of wheat! 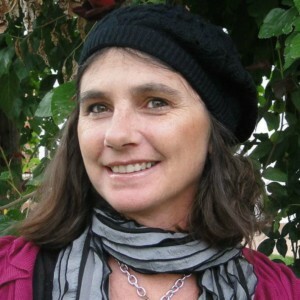 Hi Jacqui, really scrumptious recipes. The baked macheroni one I usually add eggs.